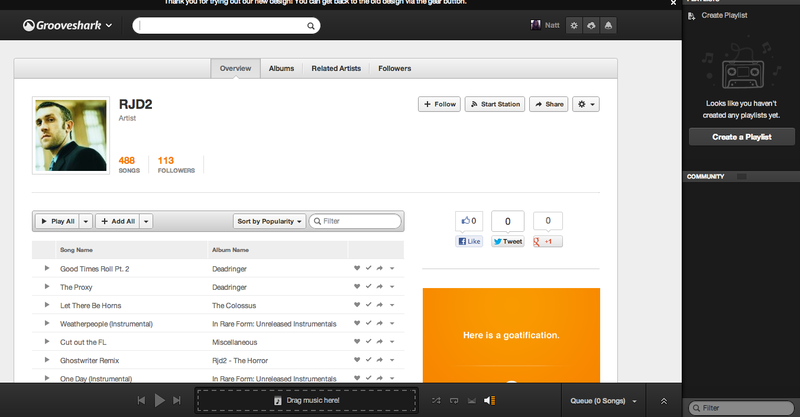 Grooveshark redesign puts more power into artists’ hands, but is it enough to fend off copyright fiends? Undermined by the likes of popular music streaming services like Spotify, Pandora, and Rdio, Grooveshark has given its Web interface an overhaul to make music discovery more visual, social, and intuitive. The redesign comes after the site got notoriously banned by Facebook, Apple’s App Stores, and Google’s Play Store. It seems to be aimed at those not yet ready to give up on Grooveshark. The new design now incorporates social features that, much like Spotify and Rdio, shows what music your added friends are listening to — not Facebook friends, obviously, since the site won’t allow Grooveshark anywhere near the site. The stream flows down the right side column, and the lower edge bar displays a list of songs that you are playing or have in queue. Another social aspect is the ability to follow an artist, friend, or just a musical influence on the Web and listen to what they’re sharing. Grooveshark maintains an edge over competitors by still offering unlimited-playlist making capability, a stream that’s uninterrupted by ads, the ability to skip tracks as often you as you desire, and the option to (controversially) upload their own music. You can choose to create a playlist by dragging the song straight onto your browser, or searching for them then click “Add to collection” to play later. Based off the music you’ve listened to, Grooveshark will also recommend songs from particular artists or genres you might enjoy, or you can choose a station for a curated playlist based on your interest. In light of copyright issues that got Grooveshark banned from social networks in the first place, artists on Grooveshark can now claim their musician profile, add their own music or delete ones that don’t belong to them, and reach out to fans. 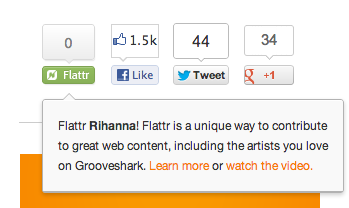 Grooveshark has also partnered with Flattr, a micropayment service, which will allow fans to donate money to support artists. “Flattr”-ing an artist is much like Liking a page on Facebook — you can allot the amount of money you want to spend on the site in a month and your budget will divide evenly among all the artists you’ve Flattred so far. This spells a neat monetary platform for independent musicians looking to share their music and build a fanbase outside of Myspace or Soundcloud, but it will still be difficult for major music labels to keep control over their property. While the new Grooveshark incorporate larger photos, more functionality, social integration, searching for music on the site can still get a little wonky. Since the site relies on users uploading their own songs, it can be hard to find the track you’re looking for especially when users upload them with the wrong song title. The new features are Grooveshark’s way of taking one step closer to winning back some credibility, but with a business model that’s still relatively shaky, it will need to do tons more to ensure copyright laws are obeyed on its platform. 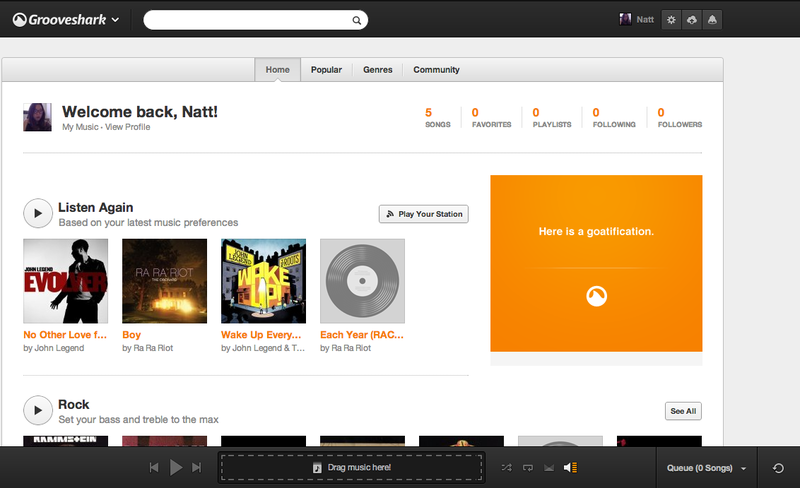 The new Grooveshark will be available for public on November 1.